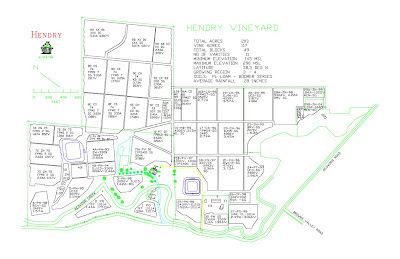 I’ve always been a big fan of both Hendry’s estate-bottled wines and wines that have been produced from fruit grown on the eponymous vineyard. This afternoon, I had the great pleasure of spending some time with Susan Ridley, George Hendry’s business partner, neighbor, and sales and marketing emissary. Over the course of an hour and a half, we not only tasted a number of Hendry’s wines, but also spoke about both the wines themselves and the history and evolution of the vineyard and winery. I’ll post my tasting notes over the course of the next week, but before I do, take a look at this video of Susan discussing Hendry. It’s a fascinating story: The level of care and attention that George Hendry puts into his land and his vines is just amazing, and shines through brilliantly in the wines he produces.